As one of the oldest buildings in San Francisco, having survived the famous 1906 earthquake, Barbarossa will showcase an entirely new concept—one that is full with legend and mystery as the space was used as a jailhouse in the 19th century. Most recently serving the neighborhood as the former Bubble Lounge, Barbarossa is where Barbary Coast atmosphere meets modern luxury, while maintaining relevancy to present San Francisco drinking culture. We're celebrating Cinco De Mayo with TWO NIGHTS of tequila-fueled entertainment! Join us for specialty margaritas, 18 different beer options, party favors, and live DJs both nights! RSVP below for our annual Cinco De Mayo Fiesta! 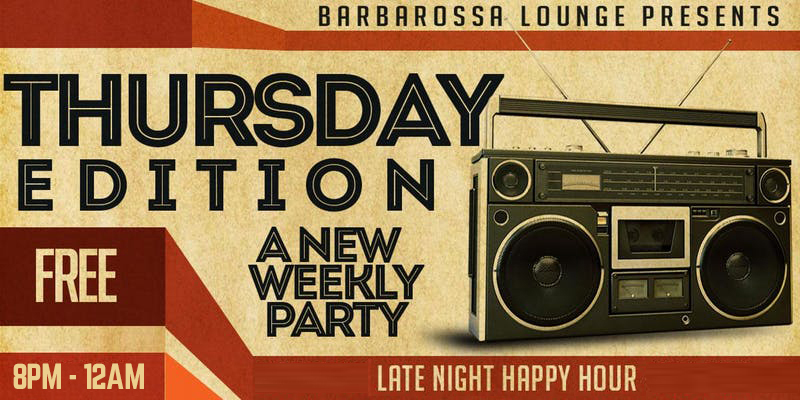 Barbarossa Lounge Happy Hour features handcrafted cocktails and flight specials. 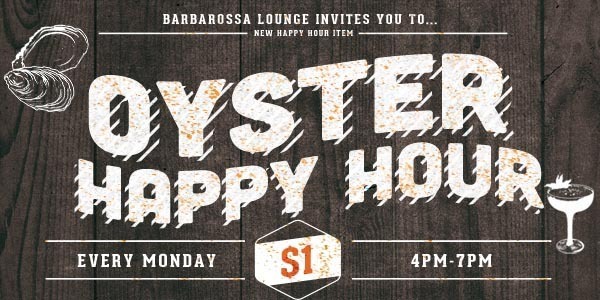 $1 Oyster special between 4pm-7pm. Barbarossa Lounge Happy Hour features handcrafted cocktails and flight specials. Try our Grog, Champagne, Wine or Beer Flights between 4pm-7pm. Make table or bottle service reservation online or by calling us directly. Barbarossa Lounge is an ideal venue for private and corporate events and well as special occasion gathering. Please use this form to inquire about our venue packages. Barbarossa’s beverage program includes a seasonally rotating 11-cocktail menu with drinks that are named after famous criminals, madams, dance hall girls and politicians of the time. 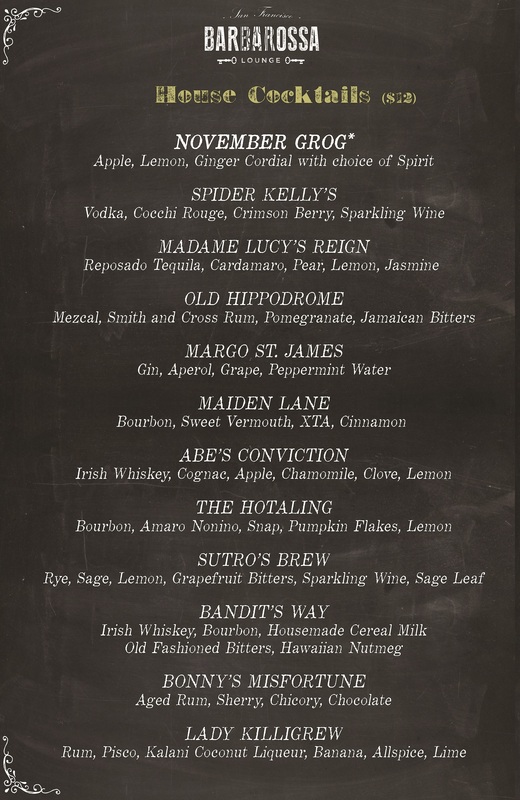 The beverage menu is made complete with "signature Grog". Grog is a drink of historical significance and supports Barbarossa’s Barbary Coast sensibility perfectly. This drink was often consumed by pirates and sailors, mixing three main ingredients: spirit, citrus and water. The citrus was used to ward off scurvy, while the spirit (typically rum) was used to keep the water from going rancid. Grog is served Collins-style. Each grog may be ordered with the patron’s own spirit of choice, although it goes best with Whiskey or Bourbon. In addition to the cocktail menu, Barbarossa offers a selection of beer (12 on tap), wine, and selection of champagne. The bar also features champagne flights, champagne both by the bottle (approximately 30) and by the glass, of harder-to-find varietals. This is somewhat in homage to its former concept and as they still have access to one of the most curated champagne selections in the Bay Area. Barbarossa's food menu is simple, reasonably priced, and meant to share. The menu is broken down into four main categories that were popular on menus during 19th century: “from the ocean” (raw bar), “leaves, fruits and roots,” “meats & cheeses,” and “dessert.” The “from the ocean section” prominently features oysters, both local and imported. Popular items include Sausages (current vendor, Foreign Cinema/ShowDogs) as well as the Red Pastrami. All oysters will be served with 4-5 different, seasonal vinaigrettes; all flavor profiles are meant to support the cocktails. Barbarossa’s beverage program is led by the talented mixologist "JORGE WYNNE". 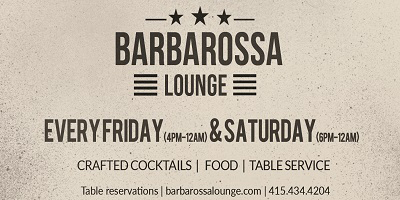 Barbarossa Lounge is located at 714 Montgomery Street in San Francisco near The Transamerica Pyramid building on the corner of Montgomery St. and Washington St.